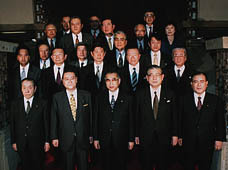 Prime Minister Keizo Obuchi on January 14, 1999, named his new cabinet and launched a coalition government comprising his own Liberal Democratic Party and the Liberal Party. Obuchi pared the number of ministers in the new cabinet from 20 to 18; in all, 3 members of the previous cabinet resigned, making room for Liberal Party member Takeshi Noda to take the position of minister of home affairs. The LDP had been carrying out talks with the Liberals in order to form a political alliance between the two conservative parties and bolster its position in the House of Councillors, where it lacks a majority. (The LDP enjoys a majority in the House of Representatives.) The LDP-Liberal tie-up brings the coalition within 11 seats of a majority in the Upper House; the parties hope this will lead to smoother sailing for their policy proposals there. Liberal Party Secretary General Takeshi Noda was tapped to become home affairs minister after Ichiro Ozawa, the party president, declined the spot. Ozawa had been urged by Obuchi to join the cabinet, but he cited his desire to concentrate on Liberal Party affairs and recommended Noda for the position. Based on an agreement between the two parties, Obuchi also reduced the number of ministers from 20 to 18. Four posts will be held concurrently by already serving cabinet members: Minister of Construction Katsutsugu Sekiya will also hold the post of National Land Agency chief, Chief Cabinet Secretary Hiromu Nonaka will head the Okinawa Development Agency, Minister of Transport Jiro Kawasaki will serve as chief of the Hokkaido Development Agency, and Akito Arima will add the post of Science and Technology Agency chief to his current position as minister of education. Three-term member of the House of Councillors; Parliamentary Vice-Minister for Agriculture, Forestry, and Fisheries. Nine-term member of the House of Representatives; Director General, Economic Planning Agency (State Minister); Construction Minister. Five-term member of the House of Representatives and one-term member of the House of Councillors; Parliamentary Vice-Minister for Agriculture, Forestry, and Fisheries; Agriculture, Forestry, and Fisheries Minister.